The history of the Flavel family in manufacturing has been traced back over three hundred years. After that date the firm was steered by members of the family in Leamington Spa for nigh on 140 years. William Flavel ran a business in the mid-seventeenth century in Bilston in the Black Country, a couple of miles east of the centre of Wolverhampton; he made armouries which was a profitable industry in that time of frequent warfare. A descendant, John Flavel (1754 to 1834), was running a metal-working business in BIlton near Rugby from about 1777 and he was also an armourer as well as being a smith. A son of John, another William Flavel (1779 to 1844), was trained in metal working by an uncle in Coventry. He was clearly ambitious to take advantage of the early growth of Leamington as a spa town and moved to a house and workshop at Gloucester House in Church Street (on the corner of Gloucester Street) in the town in 1803. He soon established a showroom opposite the Old Well in Bath Street; this was later listed as 47 Bath Street and it was probably later called Hygeia House. The big breakthrough for the firm came when William designed and constructed The Leamington “Patent” Kitchener range around 1830. 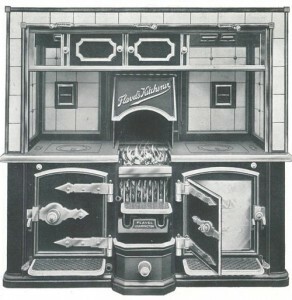 The Kitchener was a cooking range that was made from cast iron and consumed solid fuel. However, it is uncertain whether Flavel ever formally patented this design. The largest unit was said to replace five fires and two cookers. The Kitchener was something of a sensation and William soon had to place advertisements warning the public about copies of his design. Radclyffe’s and others, however, also advertised a very similar Kitchener. 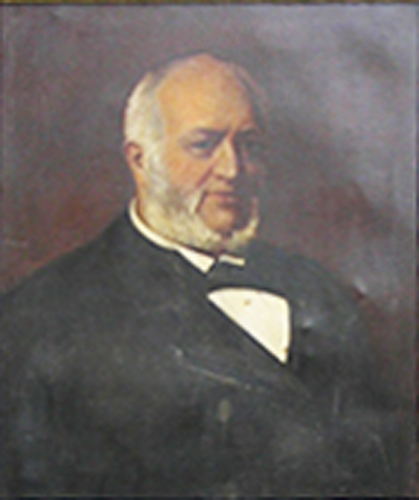 Sidney Flavel senior (1819 to 1892) ran the firm from 1844, when he was 25, on the death of his father William. He continued to produce The Kitchener and was rewarded with one of only 19 trophies at the Great Exhibition in the Crystal Palace in Hyde Park in 1851. Sidney senior moved the business to the existing Eagle foundry in 1856 and an advertisement states that he left Augusta Place (behind the tennis courts) and Emscote foundry at this date. The Eagle Foundry was immediately to the east of Ranelagh Gardens and was accessible from both Clarence Street and the Warwick and Napton Canal. It is often reported that William moved to Eagle Foundry in 1833 but, in fact, this foundry was occupied by other firms from 1833 to 1856. Sidney bought out his partners around 1867 and his son, who we will name Sidney junior, became the only other partner at the age of about 20. Sidney senior was in poor health for many years so Sidney junior was running the firm long before his father’s death. Sidney Flavel junior (1847 to 1931) was educated at Warwick School. The business continued successfully during his long stewardship. 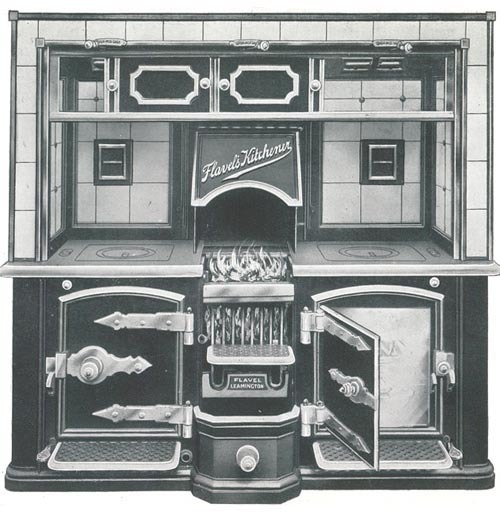 The firm had concentrated on solid fuel appliances but made their first gas cooker in the 1880s. 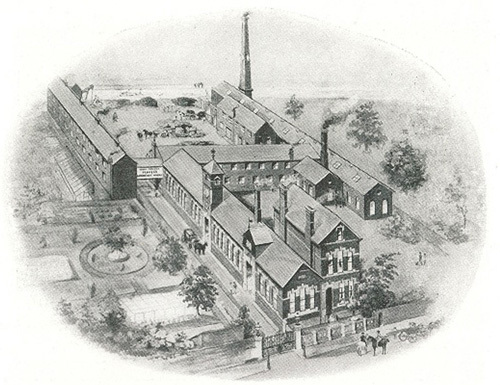 There was a dispute around 1902 when Sidney accused the firm of Radclyffe and Co at the Imperial Foundry of copying products and the outcome was that Flavel’s took them over. Flavel’s then used the Imperial Foundry until it was sold on to Ford’s in 1940. Sidney junior is perhaps best remembered for his public-spirited works. 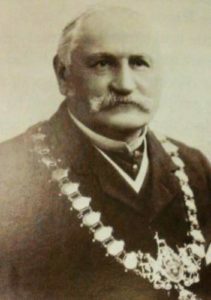 He was elected to the new borough council in 1875 and was mayor on six occasions. Percival Flavel (1889 to 1939), a son of Sidney junior, became managing director in 1916. It became a difficult period for the company as it wished to expand on a site bordered on three sides by the canal and housing and to the east by a recreation ground. There were complaints from neighbours about noise at night and fumes at all times. Sadly Percival committed suicide by gas inhalation at the London office in 1939. Isobel Flavel, Percival’s wife, was chairman of the board from 1939 to 1944. From 1944 the chairman and many of the directors were not connected to the family although two or three of the family did take on managerial roles. 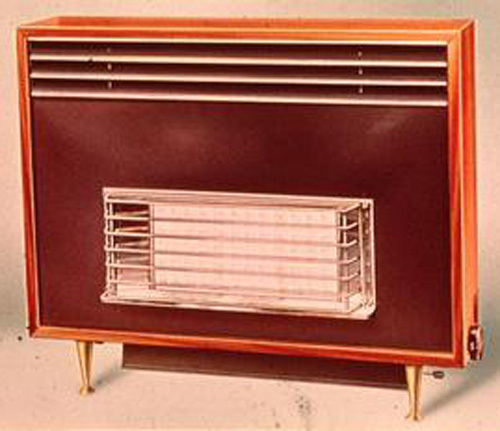 The company struggled after the war but fortunes turned in a positive direction when the company launched the Debonair gas room heater in 1961. This was the first one of its type with a wooden surround and it chimed well with contemporary fashion. Sales were phenomenal and 1963 was the best year ever for the firm. The company was sold on and is now in the hands of Aga Rangemaster. The Flavels brand name was sold on to other companies.